Sometimes it’s easier to say no to someone you don’t know than someone you do know. Makes sense. There are no stakes involved when you tell a customer service person or a salesperson that you don’t like something. They’re used to hearing no and you probably won’t hurt their feelings. Plus, you may never see or speak to them again. However, when you say no to someone you do know, depending on the person and your relationship with them, you may hurt them or offend them. I understand that I am not responsible for other people’s reactions, but still out of consideration, I try say “no” in the nicest way possible. I try to be a little more direct. My friend, Carrie, and I have different senses of style, so when she shows me a pillow she likes and says, “Isn’t that’s cute?” I usually couch it with “Oh, I could totally see that in your place.” I know that I wouldn’t like it in my home, but because she’s excited, why should I ruin her fun? I just know that we have different tastes. Sometimes when I have similar taste to a friend and they show me something I don’t like, I still feel bad. I might say, “Oh, cool” and keep moving on. I realize that’s not a direct no, but you have to handle these matters delicately. That’s why this handy guide that a friend posted on Facebook last year can be helpful. I do #2 all the time (Ha ha, sounds like Beavis.) With clients, with fellow show producers, with friends, you name it. I know when someone has to say no to me, but they offer to help me out, I really appreciate that. I think it’s okay and healthy to say no to take care of yourself (hello, boundaries), but you also need to consider the other person. Not overthink or worry about how they’ll respond, but at least keep their perspective in mind. For example, a few months ago there was a chance I was going to have to cancel a speaking gig I had booked months earlier due to a client conflict. I put myself in the producer’s shoes and thought about what would go through her mind and what would be best for her. I had the benefit of giving her two months’ notice. I have had performers cancel on me within 30 minutes of a show, so I knew I wasn’t leaving her in the lurch. She wound up being very understanding, appreciative of my professionalism and helpful attitude and said she had a long list of speakers she could call on and she’d book me down the road. Do you have an easy time telling people no? 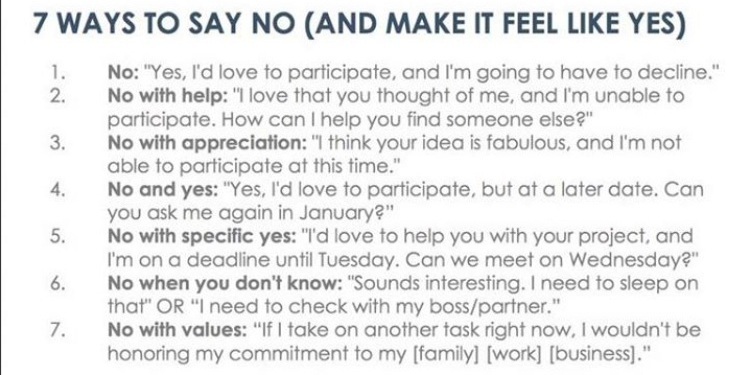 Do you try to be polite with your no’s or are you more direct? Tell me below and if you like what you’ve read, please share it and subscribe below. Thanks!